TripAdvisor’s website has been a go-to for tips and suggestions for almost any type of traveler for several years. Built mainly on the forums and reviews contributed by users of the site, TripAdvisor manages to stay rather down-to-earth about travel. The TripAdvisor iPhone app takes the most frequently used options of the website and condenses it down to the basics, making it readily accessible as an app but still immensely useful. The TripAdvisor iPhone and iPad app (now renamed to TripAdvisor Hotels Flights Restaurants) is very simple, which is perfect for travelers. After all, you don’t want to waste precious vacation time trying to find some place to eat at: you just want to know where to go right now. Set your current location with the app–or not; you can always manually type in your location and start finding places near you. 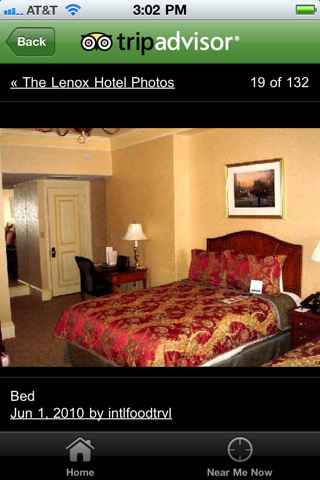 The app can search for hotels, restaurants, things to do, and book flights with a few taps. If you’re not sure what category your search would fall under, there’s a search bar at the very top of the home page for a general search. Don’t worry about not knowing the full name of something–TripAdvisor will start listing suggestions as you type. Just tap on the list to select your choice and the app will fill in the rest. If you’re not sure what exactly you want to do, tap on “Near Me Now” to see what’s going on in your immediate vicinity. Have some questions about the area you’re in that have nothing to do with hotels or restaurants? Tap on Forums and check out what other travelers have to say about their own experiences when they visited there. If you’re standing around waiting for a train or just bored, you can kill some time writing your own review through the app. The graphics are simple and pleasing to the eye, making the app very straightforward. There are no bells or whistles to distract you from your searches. Everything you need to know about what the app can do for you is displayed right on the home page. 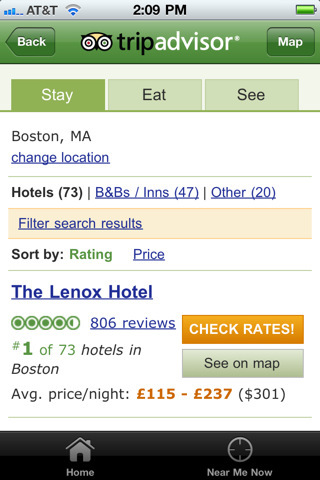 TripAdvisor also integrates Google maps, allowing you to know exactly where everything is. I can definitely see myself using the app the next time I’m traveling and need to find a place to eat or to check on flights. I really appreciate how incredibly informative the search results are, making decisions easier. I would recommend this app to anyone either travelling abroad or trying to find a new favorite restaurant. TripAdvisor has enough traffic to alleviate worries about skewed results or opinions, and the app is offered at the best possible price for people on a budget. New: The latest version of the TripAdvisor app adds the save places you like to your profile including hotel, restaurant, and attraction pages so you can find them again easily. AppSafari review of TripAdvisor was written by Julie Guan on March 4th, 2011 and categorized under App Store, Free, Fun, iPad apps, Local, Reference, Travel, Universal. Page viewed 6346 times, 2 so far today. Need help on using these apps? Please read the Help Page. i believe which will,Your development of a culture conditional on sense of balance.